The adventure tourer segment is hotting up in India with the Royal Enfield recently launching its first adventure-tourer ‘Himalayan’. The Himalayan takes on the KTM Duke 390 in the entry-level adventure-tourer segment. We have compared the two bikes Himalayan vs Duke 390 in this segment. Himalayan has a single cylinder, air-cooled engine with oil cooler, while the Duke 390 also has a sophisticated single cylinder liquid cooled engine. Duke’s smooth-revving engine delivers a powerful performance due to whopping 43bhp on the tap which makes it a great tourer – be it on highways or in Ghats. It is way too higher than the Himalayan which gives out only 24.5bhp. The effective power-to-weight ratio for Himalayan is only 134 Bhp/tonne, whereas for Duke 390 it is 316 bhp/tonne - almost 2.5 times the Himalayan. 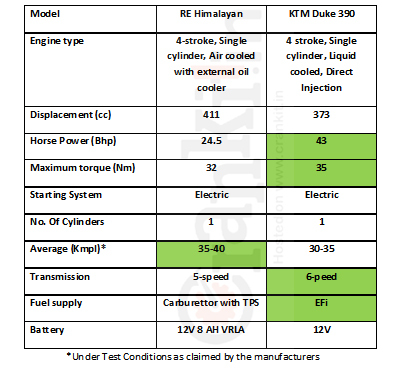 Among the two, the Duke’s torque value of 35 Nm is marginally higher than Himalayan’s 32 Nm. This gives Duke 390 a great pulling ability on slopes. While Himalayan gets a 5-speed, the Duke 390 gets a 6-speed gearbox. Following is the comparison of the RE Himalayan vs Duke 390. Both the bikes are equipped with electric start option. In the fuel-economy, the Himalayan is likely to give upto 35-40 Km/L, while Duke 390 claims to deliver a decent mileage in the range of 30-35 Km/L. So, overall, RE has managed to obtain a fair performance in power & mileage for Himalayan. Both the Himalayan & Duke 390 bikes are equipped with an ‘Upside Down’ telescopic-hydraulic suspension on the front. Duke 390 has bigger 43 mm fork as against Himalayan’s 41 mm. On the rear, both Himalayan and Duke 390 provide Mono-shock suspension. The two bikes compared here provide 17” wheels at rear. However, the Himalayan provides a bigger 21” wheel on the front as against Duke’s 17”, while Duke’s rear tyre is bit wider than Himalayan. Himalayan provides steel spoke wheels, the Duke 390 provides alloy wheels which add to the ride comfort. Both the models compared have 300 mm disc brakes on front. 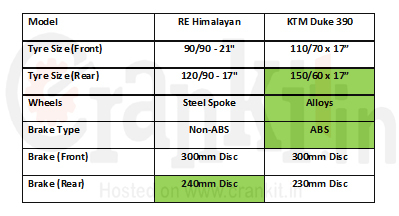 The rear disc on the Himalayan is slightly bigger in size of 240mm dia. whereas that on the Duke 390 is 230 mm. However, among the two, only Duke 390 provides an ABS which is a great advantage on Indian roads. With 2190 mm length, RE Himalayan is longer than Duke 390. Among the two, Himalayan also has longer wheelbase of 1465mm. The Himalayan has been specifically designed by keeping in mind the rough & hilly terrain of Leh & Ladakh. With 220 mm ground clearance, the Himalayan will be able to navigate this most difficult terrain of the Himalayas with ease. The 15 litres fuel tank of the Himalayan would cover more distance, making it an ideal adventure tourer. However, with just 11 litres fuel tank, Duke 390 would need frequent re-fuelling on the long distance touring. With kerb weight of just 139 kg, Duke 390 is the lightest & agile bike among the two. Himalayan weighs a whopping 182 kg; making it heavier among the two. RE’s first attempt to make an adventure tourer could have been fruitful if it had managed to keep its weight under check. Although it is designed for hilly terrain, with 182kg Himalayan could lose all its advantage as most of its power will be spent pulling its dead weight. RE has priced the Himalayan very competitively at Rs. 1,55,000/- (ex.show-Delhi). But, it doesn’t come with an ABS which Duke 390 provides as standard. The Duke 390 is the lightest & most powerful bike; which provides great value for money by giving features like the liquid-cooled engine, ABS & alloy wheels at an added price. With a price-tag of only Rs. 1,55,000/- and an expected mileage of 35-40 Km/L, the Himalayan has emerged as the most affordable adventure tourer – both to own and to run. Ford sync: The ultimate car infotainment system…! Honda smart charge: rewarding smart charging is here.